Burn Calories, Entertain Visiting Friends & Toast to the Holidays! This holiday season plan a Golden hike to entertain out-of-town visitors and burn off some of those unwanted holiday meal calories. Afterwards, celebrate the season with a fresh craft beer and soak in the holiday spirit of Denver’s closest mountain town! Only minutes from Denver, Golden feels like a world away – especially during the holidays. The town is ringed by high buttes and mountains, all offering short hikes with gorgeous views. And its delightful downtown offers an authentic taste of a small town holiday and family fun. 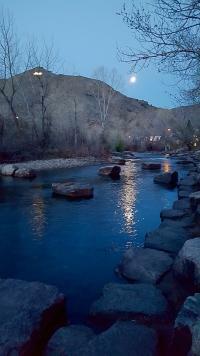 There are gorgeous lighting displays along Clear Creek, one-of-a-kind shops, an art market featuring great gifts from 100 Colorado artists, delicious restaurants and cafes and, of course, a slew of craft breweries and distilleries. Here are five holiday hikes in Golden, Colorado paired with a perfect post-hike beer to celebrate the season, friendship and to toast to more Golden adventures in 2018! Golden Gate Canyon State Park. Just a few minutes drive from town, Golden Gate Canyon can be a winter wonderland with snow frosted trees, or it can be a mild, dry hiking haven with spectacular views of the Indian Peaks Wilderness Area in the distance. It all depends on the weather. With acres and acres of evergreen forests and a huge network of trails with excellent signage and maps, this is a perfect beauty spot to take out-of-towners for some fresh air. Don’t miss Panorama Point, which has one of the most awe-inspiring views of the Front Range. Refreshments: On the way back to town, stop at the award-winning Cannonball Creek Brewing Company for a Mindbender IPA, an American style IPA with assertive notes of grapefruit and pine, balanced by Munich malts. Windy Saddle to Buffalo Bill’s Grave. Half way up the Lariat Loop Trail to the summit of Lookout Mountain, there’s a wonderful trailhead at Windy Saddle with a switchbacking trail that climbs through evergreen forests to the summit of the mountain. Here you can visit the Jefferson County Nature Center with exhibit on the elk, bear, and mountain lions who live in this forest, or push on to Buffalo Bill’s grave with its outstanding museum on the famous scout and showman. Don’t miss the Buffalo Bill gift shop! It’s filled with wacky and wonderful Old West Christmas gifts. Refreshments: You can see the summit from the outdoor patio of Mountain Toad Brewery, the perfect place to chill by a food truck, sit in the sun and enjoy a Mount Zion IPA. With its West Coast hop profile, you can taste citrus, stone fruit flavors and appropriately, pine. Mount Zion is the peak to the north of Lookout Mountain (the one with the big “M” on it for Colorado School of Mines). North Table Mountain: You don’t have to drive after this hike because the trailhead begins in the parking lot of New Terrain Brewing Co. Just behind the brewery is a spur trail that leads to the main five-mile trail around this ancient volcanic outcrop of rock. There are limited trees here, so it’s a good choice in winter with generally clear trails. At the top is a lunar landscape of rock with horizon-filling views of downtown Denver in one direction and the foothills in the other. Refreshments: Why of course, sit on the outdoor patio at New Terrain, survey your hike and have a Rambler, a malty American amber ale with tastes of caramel and peach. 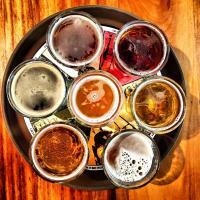 If you’re gluten, free, head to Holidaily, Colorado’s only dedicated gluten-free brewery. Try a Favorite Blonde Ale and you’ll learn that gluten-free beer can taste amazing. 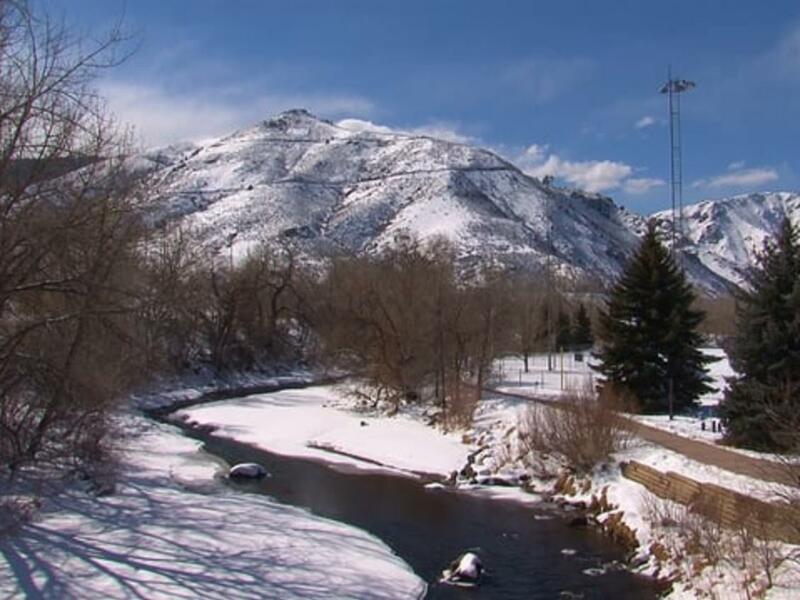 Clear Creek Trail: Everyone’s favorite all weather, year-round trail follows Clear Creek from the center of historic downtown Golden up into the foothills. The trees along the creek are lined with thousands and thousands of twinkling holiday lights. You’ll pass a historic farm museum (stop and feed the chickens) see ice flows that back up along the creekside, and continue on into pleasant evergreens. If you want more hike, cross the creek and climb to the aqueduct, which is a popular rock climbing area. You can follow the aqueduct back into Golden for a loop trip. Refreshments: Again, no driving required after this hike, as it starts and ends within a block of Golden City Brewery. This famous little craft brewery is located in the brewer’s backyard. Head to the garage to order your beer then sit by an outdoor fire. There are often musicians on the weekends. Your beer? The Clear Creek Gold Pale Ale, of course. 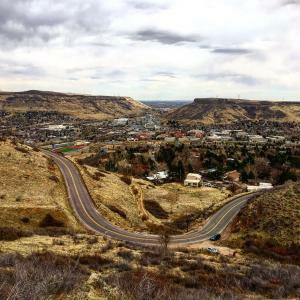 South Table Mountain: This short, steep hike pays off big dividends since it has the best view into downtown Golden far below. The volcanic butte is where the first T-rex skeleton was ever discovered, and is the famous western landmark on the old Coors logo (Coors Brewery is located at its base). 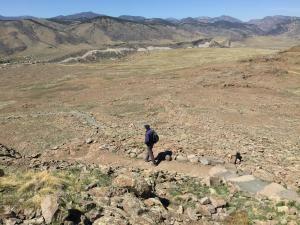 There are no trees on this rocky landscape, so the trail is generally dry except after a recent snow. As in any winter hike, lookout for icy patches, which are always possible. The view from the top looks south along the Foothills and you can see everything from Pikes Peak in the south to Longs Peak far to the north. Refreshments: If you haven’t been to Coors, stop by for their free tour (and three free samples!) The gift shop is filled with holiday gift ideas. Or back in town, just a few minutes away, try Barrels & Bottles, the only craft brewery in town that gives equal attention to beer AND wine with two dozen craft beers and two dozen tap wines available. Try the Orange Creamsicle Blonde Ale, which is brewed with orange peel and vanilla beans. Cheers to a great Golden adventure with family and friends this holiday season! For more information on Golden, be sure to follow @VisitGoldenCo on Facebook, Instagram and Twitter and check out www.visitgolden.com for the latest news.